Welcome to World Doula Week! 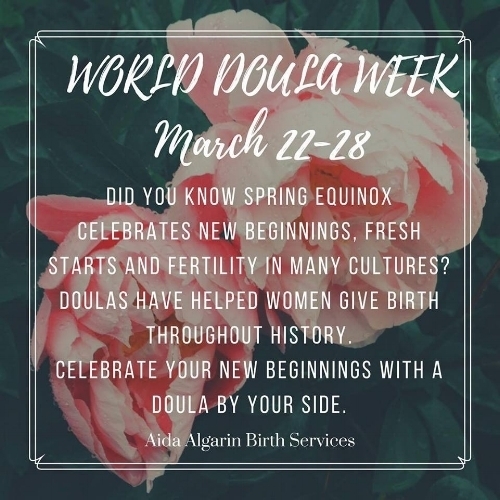 Started by Ruti Karni Horowitz in 2011, World Doula Week celebrates and recognizes the work that doulas do around the world to provide emotional and physical support to families in birth and in the postpartum period. This week aligns with the Spring Equinox which historically celebrates new beginnings and the start of the fertility cycle. In the spirit of fresh starts, it is this week that I have chosen to launch my new website for Aida Algarin Birth Services. Let me join you in celebrating your new beginning as your doula. Contact me today about custom packages to meet your needs.